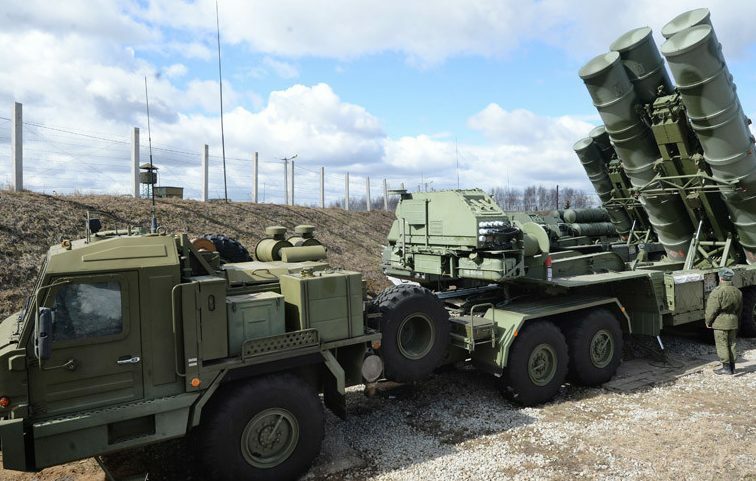 After almost a year of negotiations Ankara has agreed to pay $2.5 billion for the S-400 Triumf. The Russian air defense system is considered one of the most advanced in the world and this deal marks a breakthrough between the former rivals. Though it may appear surprising a staunch NATO ally is buying an advanced weapon system from Russia, this isn’t too controversial in light of Ankara’s coziness with Chinese military technology for its own ballistic missile program. The Turks have never hesitated seeking alternatives to whatever NATO can’t provide. But rough sailing might still jeopardize the S-400 deal. It was only announced in July 2017 and it appears the transaction is financed with a loan. The goods purchased are rather modest anyway, with just two batteries scheduled for delivery within 2018 according to multiple sources. Further risks are the lingering fallout from an earlier attempt to buy Chinese HQ-9’s, which are analogs of the S-300, and a potential clash between what Ankara is paying for and what the military and its partners in the private sector are trying to build. Turkey has several domestic missile programs in the works and a theater defense system is well within local industry’s expertise. It’s not as if Turkey’s access to NATO missile defense complexes is restricted either. Germany, the Netherlands, and the US helped protect Southern Turkey from hostile Syrian aircraft by deploying Patriot batteries near major cities; these commitments ended by 2015. The resulting gap in its border defense might have hastened Ankara’s desire for its own long-range SAMs. Turkey’s options among its longstanding allies include cutting-edge models from France, Germany, and the US. Even Israel’s impressive portfolio of missiles and their guidance systems are available to global clients. But Ankara’s recent drift closer to Moscow and the fresh bilateral agreements this inspired eventually blossomed into a major arms purchase. Turkey has been a customer of Russian weapons in the past. During the 1990s it bought enormous stocks of surplus Warsaw Pact arms and equipment. A rash of joint ventures were discussed with Russian firms too and the army even adopted the advanced Kornet anti-tank missile. 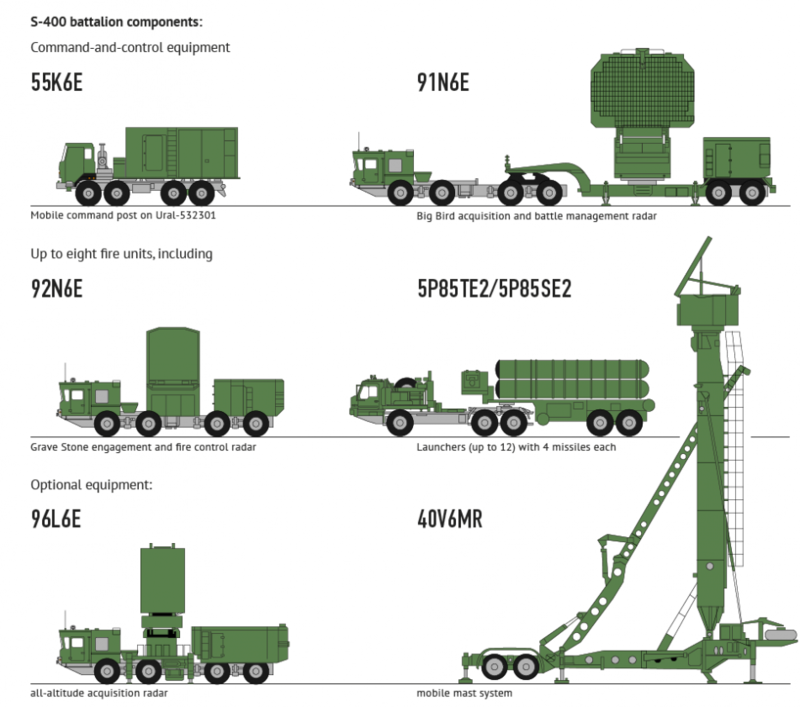 The S-400 Triumf, designated the SA-21 Growler by NATO, is a new integrated air defense system for thwarting surgical air campaigns and offshore missile attacks. It entered service with the Russian military in 2007. 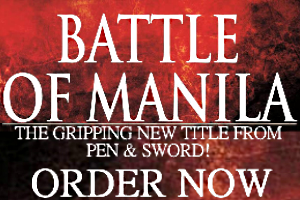 It was soon made available for export, with China and India being the most eager customers so far. When deployed, each battalion of 12 S-400 launchers and their mobile command post covers a 400 kilometer area. The S-400 is armed with the 48N6 missile whose maximum range is 250 km when tracking “aerodynamic targets.” The 48N6 is capable of neutralizing “ballistic targets” or missiles with a fragmentation warhead up to 60 km away. 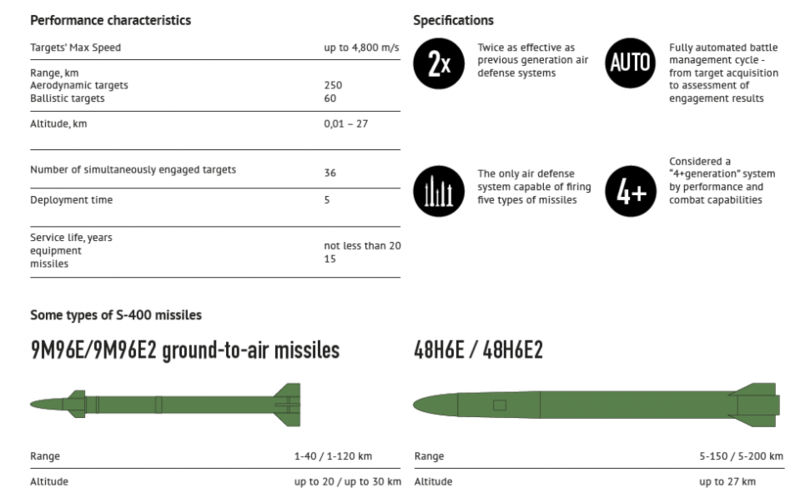 Aside from the 48N6 four other kinds of missiles can be launched from the S-400’s TEL. The Russian Federation is the most prolific operator of the S-400 and these are deployed in Kaliningrad, the Caucasus, Crimea, and Syria. The presence of S-400 batteries together with short-range air defenses are sufficient to counter sustained air and missile strikes during wartime. Its future use in Turkey may form the basis for a comprehensive national air defense network that could eventually include locally made weapon systems.